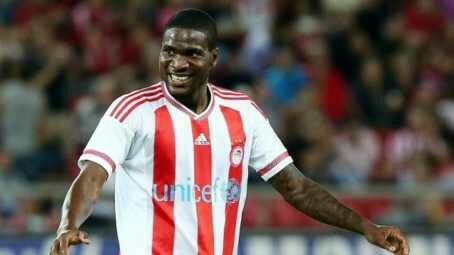 Super Eagles and former West Brom forward Brown Ideye has made a shocking move to china, as he becomes the latest Nigerian player to join the Chinese moneybags. Former Olympiakos striker who has been on Tianjin Teda's radar before the close of the transfer window in January has completed a transfer fee of 12Milllon Euros to join Super Eagles captain John Mikel Obi, With about 3.5 million euros every season becoming the sixth highest paid Nigerian player. Ideye was West Brom's record club signing when he joined The Throstles from Dynamo Kiev in 2014, however, he did not perform to expectations, scoring just seven goals in thirty-one appearances in all competitions for the Baggies before he left for Olympiakos, where he resurrect his career back on track. The 28-year-old scored 13 goals in his first season in Greece and help Olympiakos win the Greek Super League, having started this season with 15 goals in all competition, surpassing his previous goal feat last seasonIt's no news anymore as the Chinese Moneybags are scouring all over the world to bring in new players to the league before their transfer market closes later this week, ahead of the start of the new season next month. 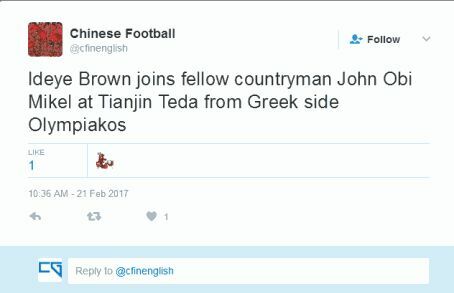 Tianjin Teda signed Ideye's Nigerian teammate John Obi Mikel from Chelsea during the January transfer window and now the Chinese outfit adds Brown Ideye as their latest marquee signing.